Sunday March 27 1910. Easter Sunday and warm as summer as it has been for nearly two weeks. I went to church stopping to see Eugene who seemed very sick. Rob & Cora gave me an Easter Lilly in a pot. I brought home with me. Charlie Hedges Jr was out in the afternoon looking at the [illegible]. 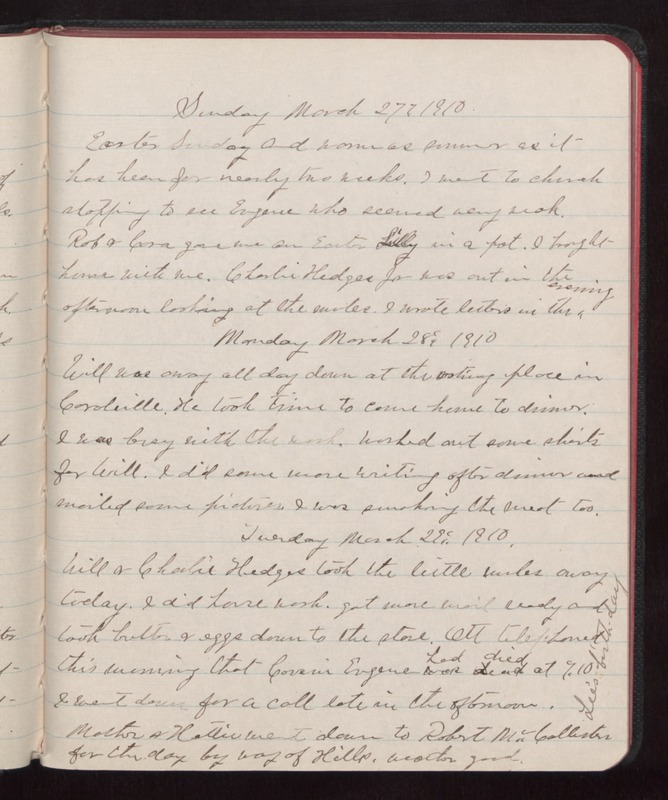 I wrote letters in the evening Monday March 28 1910 Will was away all day down at the [illegible] place in Coralville. He took time to come home to dinner. I was busy with the work. Washed out some shirts for Will. I did some more writing after dinner and mailed some pictures. I was smoking the meat too. Tuesday March 29 1910 Will & Charlie Hedges took the little mules away today. I did house work. got more mail ready and took butter & eggs down to the store. Ott telephoned this evening that Cousin Eugene had died at 9.10 I went down for a call late in the afternoon. Lee's birth-day Mother & Hattie went down to Robert McCallisters for the day by way of Hills. Weather good.